Wednesday, German Chancellor Angela Merkel recognized that Germany has “no-go areas” — places where police and public safety personnel cannot visit without risking serious physical harm. A short Associated Press item on her statement described “German officials” as “speechless.” It appears that the wire service’s Berlin reporter shared that assessment, and may even have believed that Merkel had fabricated her claim. The AP reporter then cited two spokespersons, one for the chancellor and another for the nation’s Interior Ministry, who “declined to identify no-go areas.” Apparently that keeps hope alive for no-go zone deniers. Merkel’s admission finally acknowledges that large portions of the nation’s migrant and previous immigrant populations have no intention of assimilating into German customs or adopting democratic values. The “speechless” response among “German officials” is occurring only because Merkel dared to speak a truth that recognized by German law enforcement personnel for at least six years, and in other EU countries for longer than that. 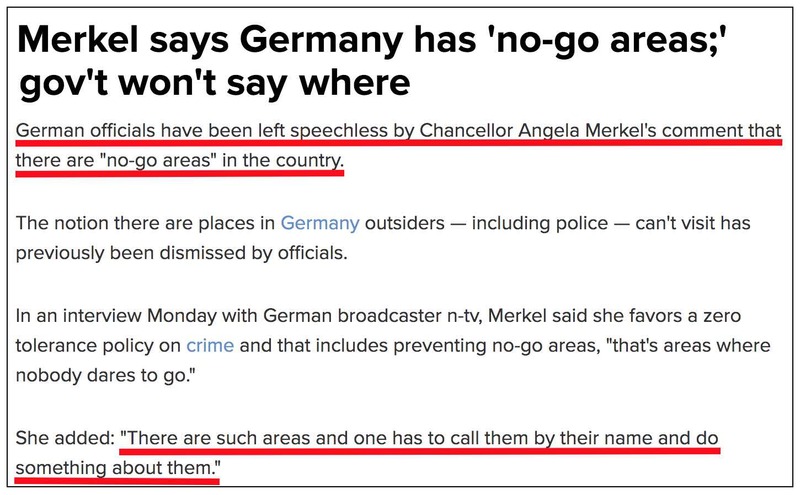 Merkel’s admission is a direct slap in the face to the no-go zone-denying U.S. press, which has for years been shouting down no-go zone recognizers any time someone in authority mentions them, and which has virtually banished journalists’ use of the term unless it’s uttered by a prominent public official. A New Republic writer who apparently didn’t read the memo acknowledged their existence shortly after the jihadist Charlie Hebdo murders in Paris three years ago. The deniers’ intimidation campaign persisted — even though NBC News and the New York Times had recognized their existence ten years earlier during France’s Muslim youth-driven riots in 2005. Even then, the Times reported there were 150 French no-go zones. The deniers also shifted into high gear after responsibility for a series of jihadist attacks in France which killed 130 was traced to residents of a Belgian no-go zone in November 2015. Will Merkel’s admission finally force the U.S. press to recover its sanity in this matter — or will they now turn on the German chancellor, who not long ago was Time’s 2015 Person of the Year for her permissive migrant policies?